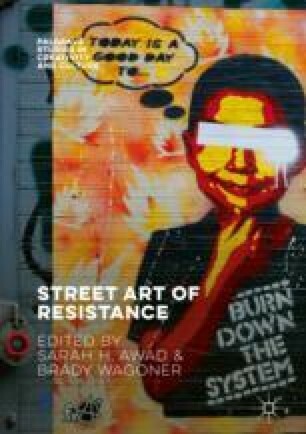 In this chapter, I propose that indigenous graffiti and street art are interconnected with the political mobilization of indigenous groups who actively oppose the structural and systemic histories of violence suffered by indigenous people under settler colonialism. Indigenous graffiti and street art work to destabilize colonial occupations of indigenous territory, by drawing attention to the ways that the existence of settler colonial infrastructure and architecture operates as material evidence of indigenous suffering. By attempting to reclaim the constructed spaces of colonialism through modes of socio-aesthetic intervention, I maintain that the work produced by indigenous graffiti writers and street artists unfold productive strategies of decolonization. My analysis raises questions about the radical potential of indigenous graffiti and street art to delegitimize oppressive social conditions inflicted upon indigenous people by colonial powers. The author asks the reader to observe that he is of Euro-Canadian descent. and we can all move on we can be reconciled except, i am graffiti. except, mistakes were made.